Maag Industrial Pumps, has announced that its EnviroGear - Seal-Less Internal Gear Pumps have taken the safe, efficient and reliable handling of high-value, dangerous or hazardous chemicals to the next level of full containment. Traditional magnetically coupled internal gear pumps utilize two fluid chambers that are separated by an adapter plate, which can result in product entrapment and poor reliability when transferring high-viscosity fluids. However, EnviroGear pumps feature a revolutionary between-the-bearings design that places magnets directly on the rotor, eliminating the need for an adapter plate and allowing for a single fluid chamber. The result is a pump that features a simpler flow path, which allows the pump to handle both water-like liquids and those with viscosities to 50,000 cSt, while providing leak-free product containment. EnviroGear pumps have been constructed with only seven primary parts, which helps contribute to an estimated 50% reduction in maintenance costs when compared to sealed pumps. 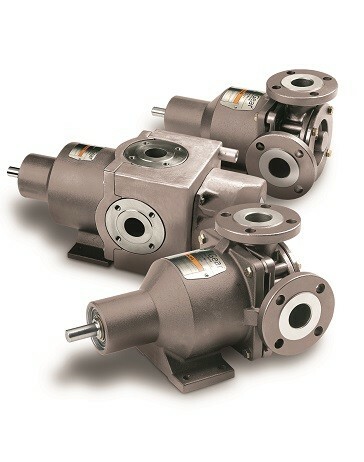 These pumps have also been designed to be interchangeable with up to 95% of the internal gear pumps that are currently available on the market. That means no piping changes, no driver changes, no coupling changes, no flow-rate changes and no baseplate changes. Additional features include a stainless-steel, ductile-iron or carbon-steel construction; a rotor and idler supported at three locations that eliminates cantilever load; large, long radial bushings to support the entire length of the rotating element; and consistent flow when handling either water-like or highly viscous liquids.